Welcome to the website of the Unitarian Church of Sharon. We are a congregation of about 180 adult members, and 95 children and youth, located in the center of Sharon, Massachusetts at the corner of Depot and North Main Streets. We are delighted to welcome all who wish to join us in church on Sunday, in Religious Education classes for children and adults, and at fellowship and social justice events. Our Sunday morning worship services begin at 10:00 a.m. with a family service (adults and children) followed by a 10:30 a.m. adult service (while children attend their religious education classes). The adult service and the religious education classes both end at 11:30 a.m. and are followed by a time of refreshment and fellowship. Please Note: From mid June until early September we are on a summer schedule and there will be only one morning Sunday service with child care. There will not be religious education during that period. Also, staff and minister office hours are altered during the summer months. However, you can always leave a message with any of the staff members, and they will respond as soon as possible. Rev. Wendy L. Bell is the interim minister. Her office hours are Tuesday, Wednesday, Thursday from 11:00 a.m.–4:00 p.m. She can be reached at 781-784-3652 extension 2. Contact Rev. Wendy for an evening or weekend appointment. Director of Religious Education, Louise Marcoux, is available Tuesdays, Wednesdays, and Thursdays from 8:30 a.m.–2:30 p.m. She can be reached at 781-784-3652 extension 3. Office Manager, Linda Cveckova, is in the office Mondays, Wednesdays and Fridays from 9:30 a.m.–1:00 p.m. She can be reached at 781-784-3652 extension 1. 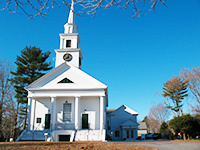 The Unitarian Church of Sharon is descended from the First Parish in Sharon which first gathered in 1737. Our Meetinghouse dates from 1842 and is listed in the National Registry of Historic Sites. Get a glimpse of our storied past. Our historic Meetinghouse available for rental for special occasions. Our newly renovated and redesigned vestry and new meeting rooms are a good place to hold your next meeting or gathering. 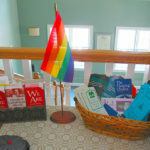 There are a wide range of committees and task forces at the Unitarian Church of Sharon. Get more information about them and get involved.